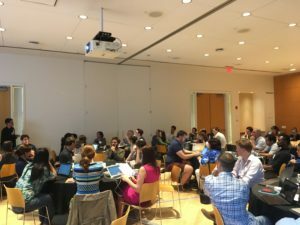 In this post, we describe the Privacy through Contextual Integrity (PrivaCI) challenge that took place as part of the symposium on applications of contextual integrity sponsored by Center for Information Technology Policy and Digital Life Initiative at Princeton University. We summarize the key takeaways from the unfolded discussion. We welcome your feedback on any of the aspects of the challenge, as we seek to improve the challenge to serve as a pedagogical and methodological tool to elicit discussion around privacy in a systematic and structured way. See below the Additional Material and Resources section for links to learning more about the theory of Contextual Integrity and the challenge instruction web page. What Is the PrivaCI Challenge? In the symposium, we used the challenge to discuss and evaluate recent-privacy relevant events. The challenge included 8 teams and 4 contextual scenarios. Each team was presented with a use case/context scenario which then they discussed using the theory of CI. This way each contextual scenario was discussed by a couple of teams. Context Scenario: The template included a brief summary of a context scenario which in our case was based on one of the four privacy news related stories with a link to the original story. Contextual Informational Norms and privacy expectations: During the discussion, the teams had to identify the relevant contextual information norms and privacy expectations and provide examples of information flows violating these norms. Example of flows violating the norms: We asked each flow to be broken down into relevant CI Params, i.e., Identify the actors involved (senders, receivers, subjects), Attributes, Transmission Principle. Possible solutions: Finally, the teams were asked to think of possible solutions to the problem which incorporates previous or ongoing research projects of your teammates. What Were The Privacy-Related Scenarios Discussed? We briefly summarize the four case studies/privacy-related scenarios and discuss some of the takeaways here from the group discussions. St. Louis Uber driver has put a video of hundreds of his passengers online without letting them know. Facebook asked large U.S. banks to share financial information on their customers. Other groups, could not always identify norms that were violated. For example, in the same “Google tracks your movements, like it or not” scenario, one of the teams could not formulate what norms were breached. Nevertheless, they felt uncomfortable with the overall notion of being tracked. Similarly, a group analyzing the scenario where “Facebook has asked large U.S. banks to share detailed financial information about their customers” found that the notion of an information flow traversing between social and financial spheres unacceptable. Nevertheless, they were not sure about the governing norms. The unfolded discussion included whether norms usually correspond to “best” practice, due diligence. It might be even possible for Facebook to claim that it is all legal and no laws were breached in the process, but this by itself does not mean there was no violation of a norm. The challenge showcases the norms and privacy expectations may vary. Some members of the group, and across groups, had different privacy expectations for the same context scenario. For example, in the Uber scenario, some members of the group, expected drivers to film their passengers for security purposes, while others did not expect to be filmed at all. In this case, we followed the CI decision heuristic which “recommends assessing [alternative flows’] respective merits as a function of the of their meaning and significance in relation to the aims, purposes, and values of the context.” It was interesting to see how by explaining the values of a “violating” information flows, it was possible to get the members of the team to consider their validity in a certain context under very specific conditions. For example, it might be acceptable for a taxi driver to record their passengers onto a secure server (without Internet access) for safety reasons. The challenge revealed additional aspects regarding the way groups approach the norm identification task. Two separate teams listed the following statement as norms: “Consistency between presentation of service and actual functioning,” and “Privacy controls actually do something.” These outline general expectations and fall under the deceptive practice of the Federal Trade Commission (FTC) act; nevertheless these expectations are difficult to capture and asses using the CI framework because they do not articulate in terms of appropriate information flows. This also might be a limitation of the task itself, due to time limitation, the groups were asked to articulate the norms in general sentences, rather than specify them using the five CI parameters. Once norms were identified, the groups were asked to specify possible information flows that violate them. It was encouraging to see that most teams were able to articulate the violating information flows in a correct manner, i.e., specifying the parameters that correspond to the flow. A team working on the Google’s location tracking scenario could pinpoint the violating information flow: Google should not generate flow without users’ awareness or consent, i.e., the flow can happen under specific conditions. Similar violations identified in other scenarios. For example, in the case, where an Uber driver was streaming live videos of his passengers onto the internet site. Here also the change in transmission principle and the recipient prompted a feeling of privacy violation among the group. Finally, we asked the groups to propose possible solutions to mitigate the problem. Most of the solutions included asking users for permissions, notifying or designing an opt-in only system. The most critical takeaway from the discussion on the fact that norms and users’ privacy expectation evolve as new information flows are introduced, their merits need to be discussed in terms of the functions they serve. The PrivaCI Challenge was a success! It served as an icebreaker for the participants to know each other a little better and also offered a structured way to brainstorm and discuss specific cases. The goal of the challenge exercise was to introduce a systematic way of using the CI framework to evaluate a system in a given scenario. We believe similar challenges can be used as a methodology to introduce and discuss Contextual Integrity in an educational setting or even possibly during the design stage of a product to reveal possible privacy violations. To learn more about the theory of Contextual Integrity and how it differs from other existing privacy frameworks we recommend reading “Privacy in Context: Technology, Policy, and the Integrity of Social Life” by Helen Nissenbaum. To participate in the discussion on CI, follow @privaci_way on Twitter. Join the privaci_research mailing list. Nissenbaum, H., 2009. Privacy in context: Technology, policy, and the integrity of social life. Stanford University Press. The theory of contextual integrity (CI) has inspired work across the legal, privacy, computer science and HCI research communities. Recognizing common interests and common challenges, the time seemed ripe for a meeting to discuss what we have learned from the projects using CI and how to move forward to leverage CI for enhancing privacy preserving systems and policies. On 11 December, 2017 the Center for Information Technology Policy hosted an inaugural workshop on Technical Applications of Contextual Integrity. The workshop gathered over twenty researchers from Princeton University, New York University, Cornell Tech, University of Maryland, Data & Society, and AI Now to present their ongoing and completed projects, discuss and share ideas, and explore successes and challenges when using the CI framework. The meeting, which included faculty, postdocs, and graduate students, was kicked off with a welcome and introduction by Ed Felten, CITP Director. The agenda comprised of two main parts. In the first half of the workshop, representatives of various projects gave a short presentation on the status of their work, describe any challenges encountered, and lessons learned in the process. The second half included a planning session of a full day event to take place in the Spring to allow for a bigger discussion and exchange of ideas. The workshop presentations touched on a wide variety of topics which included: ways operationalizing CI, discovering contextual norms behind children’s online activities, capturing users’ expectation towards smart toys and smart-home devices, as well as demonstrating how CI can be used to analyze regulation acts, applying CI to establish research ethics guidelines, conceptualizing privacy within common government arrangement. Yan Shvartzshnaider discussed Verifiable and ACtionable Contextual Integrity Norms Engine (VACCINE), a framework for building adaptable and modular Data Leakage Prevention (DLP) systems. Darakshan Mir discussed a framework for community-based participatory framework for discovery of contextual informational norms in small and veranubale communities. Sebastian Benthall shared the key takeaways from conducting a survey on existing computer science literature work that uses Contextual Integrity. Paula Kift discussed how the theory of contextual Integrity can be used to analyze the recently passed Cybersecurity Information Sharing Act (CISA) to reveals some fundamental gaps in the way it conceptualizes privacy. Ben Zevenbergen talked about his work on applying the theory of contextual integrity to help establish guidelines for Research Ethics. Madelyn Sanfilippo discussed conceptualizing privacy within a commons governance arrangement using Governing Knowledge Commons (GKC) framework. Priya Kumar presented recent work on using the Contextual Integrity to identify gaps in children’s online privacy knowledge. Sarah Varghese and Noah Apthorpe discussed their works on discovering privacy norms in IoT Devices using Contextual Integrity. The roundtable discussion covered a wide range of open questions such as what are the limitations of CI as a theory, possible extensions, integration into other frameworks, conflicting interpretations of the CI parameters, possible research directions, and interesting collaboration ideas. This a first attempt to see how much interest there is from the wider research community in a CI-focused event. We were overwhelmed with the incredible response! The participants expressed huge interest in the bigger event in Spring 2018 and put forward a number of suggestions for the format of the workshop. The initial idea is to organize the bigger workshop as a co-joint event with an established conference, another suggestion was to have it as part of a hands-on workshop that brings together industry and academia. We are really excited about the event that will bring together a large sample of CI-related research work both academically and geographically which will allow a much broader discussion. The ultimate goal of this and other future initiatives is to foster communication between the various communities of researchers and practitioners using the theory of CI as a framework to reason about privacy and a language for sharing of ideas. For the meantime, please check out the http://privaci.info website that will serve as a central repository for news, up to date related work for the community. We will be updating it in coming months. We look forward to your feedback and suggestions. If you’re interested in hearing about the Spring workshop or presenting your work, want to help or have any suggestion please get in touch!